At Scottsbluff Body & Paint in Scottsbluff, NE we don’t want you worried about your vehicles’ look or performance after you contact us for help, let us take care of you. We have experience working with all major insurance companies and providing accurate estimates. Whether it was a runaway shopping cart that scratched the paint or an accident; we’ve got your back because “You’re Driving Home Our Reputation.” Your vehicle will always be in great hands. As we provide you with complete auto services to get you and your vehicle back on track. At Scottsbluff Body & Paint it’s not good enough to just make your vehicle whole again. Our goal is to ensure the safety of your vehicle and return it to fully operational status. Our ASE Certified techs perform arrange of mechanical, body restoration and paint services. The entire body work repair process is quick, thorough and top notch but still affordable. A severe impact or collision may take more than reshaping your vehicle’s body and require mechanical repairs to your vehicle. Our complete collision repairs include steering and suspension work that will re-adjust any misalignment and drivability issues. Using the Velocity Frame and Measuring system manufactured by Chief Industries, our technicians can accurately restore your vehicles frame to factory specifications. The final touch of a great repair is a pristine professional paint job. Scottsbluff Body & Paint uses PPG Waterborne paint for all of our paint services not only is it one of the best paints out there it’s also Environmentally Friendly. Because our repair standards are so high we offer a lifetime guarantee on paint. 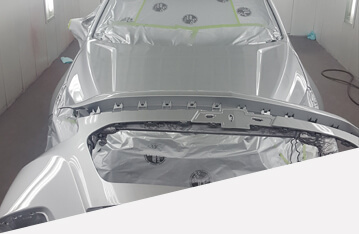 We also offer two downdraft heated paint booths for a more even paint distribution and a better finish on your vehicle. Scottsbluff Body & Paint is a member of the Nebraska Auto Body Association, I-Car and all of our technicians are ASE Certified. Schedule Auto Body & Paint Service Today! Jon and the staff at Scottsbluff Body & Paint look forward to meeting you and servicing all of your vehicle’s needs, so the next time you’re in the area feel free to stop, by for a free estimate. Give us a call today at (308)632-0839 to schedule an appointment or schedule online using our new easy online system. Remember our team of Auto Body experts is here to provide you with ALL of the services that you need after an accident. Our goal is to return your vehicle to its original condition. We look forward to servicing all of your vehicle’s needs, not only do we offer Body & Paint Repair, we also provide Computerized Estimating, Paintless Dent Repair, and Auto Detailing.